Cradlepoint continues first responder communications leadership with LTE network solutions equipped with the MC400 Modular Modem for use on FirstNet. FirstNet features are fully supported, including priorty and pre-emption as well as the Band 14 spectrum. All of Cradlepoint's dual-modem routers are field-upgradeable and accept the MC400 modem. When paired with a Cradlepoint router, this creates a full solution for mission-critical deployments, which includes unified edge security suite, FIPS 140-2 Inside, and SD-WAN capabilities. 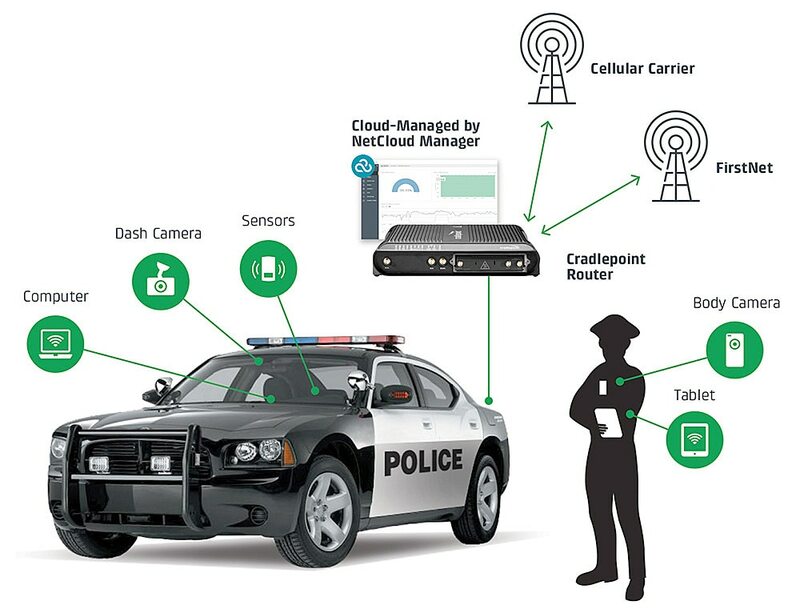 Organizations already using Cradlepoint in-vehicle, branch, and IoT solutions can easily upgrade their existing Cradlepoint router to be able to access FirstNet network by inserting the MC400 Modular Modem for use on FirstNet. This action can be taken in the field without extensive downtime. Cradlepoint first responder solutions are available for in-vehicle, in-station, and mobile command center networks. All FirstNet features across all spectrum bands are fully supported, including priority and pre-emption. The MC400 includes support for Band 14, which is critical in areas where other bands are limited. Cradlepoint solutions are field upgradeable, first-day ready, and easily managed from the cloud. Dual-modem Cradlepoint routers offer maximum reliability by supporting FirstNet with failover to alternative carrier networks. AER2200, COR IBR1700, and IBR900 Series routers support full unified edge security with FIPS 140-2 validated. Use the MC400 FirstNet Ready modem in new deployments or easily upgrade existing Cradlepoint products that accept an MC400 modem.